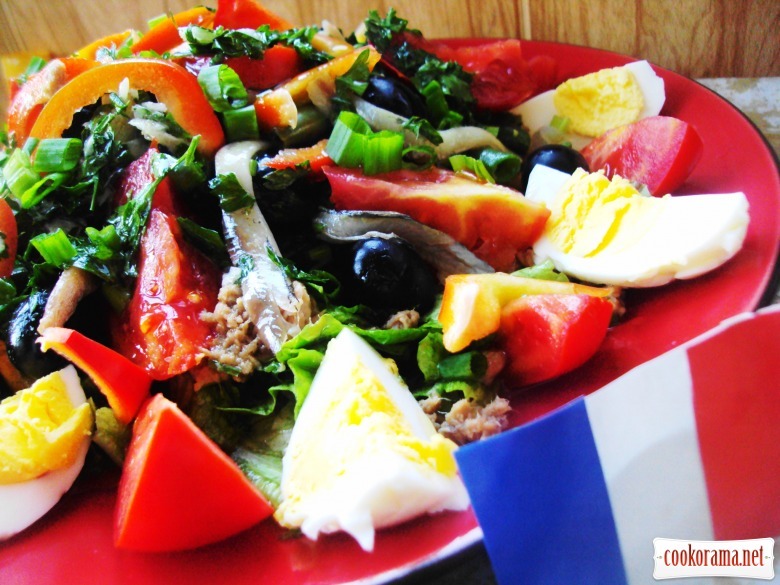 Салат Нисуаз (niçoise — из города Ницца) — French dish, more precisely Provencal cuisine. 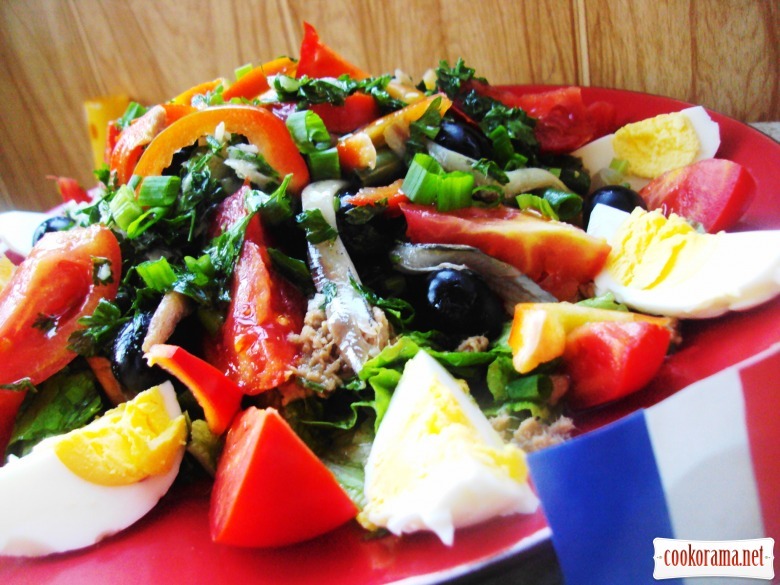 Traditional salad recipe includes tomatoes, anchovies, garlic and olives. All over the world there are many variations of cooking salad Nioise. And also, as in the case Russian salad, Caesar and Greek salad, experts scratching their heads, how to make a real Nioise. 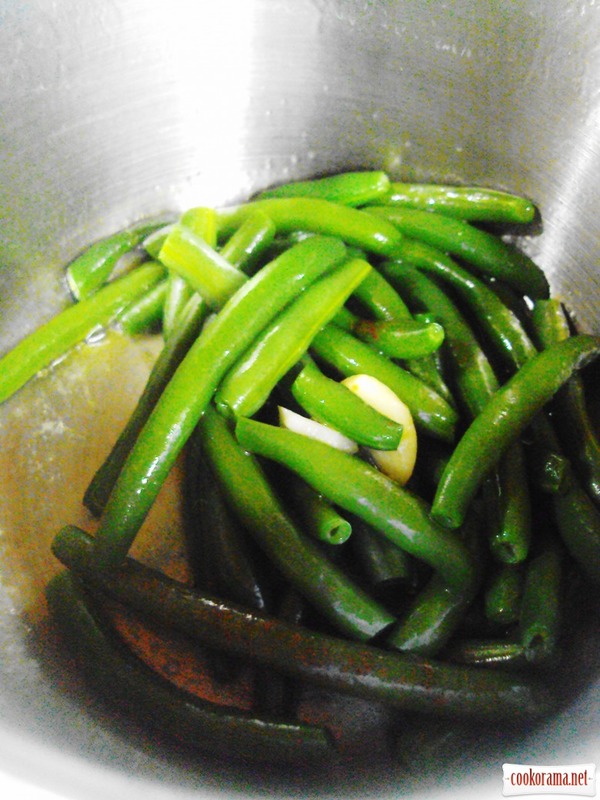 In Nioise often add green beans (beans, peas), lettuce, tuna, capers, onions, cucumbers, artichokes, peppers, hard-boiled eggs. Quite often in Nicoise put even boiled potatoes, although many cooks claim that no potatoes nor rice suit for this salad. At first, let`s make dressing. For this mix in a deep bowl and put aside olive oil, vinegar, crushed garlic, chopped basil leaves, salt and pepper. 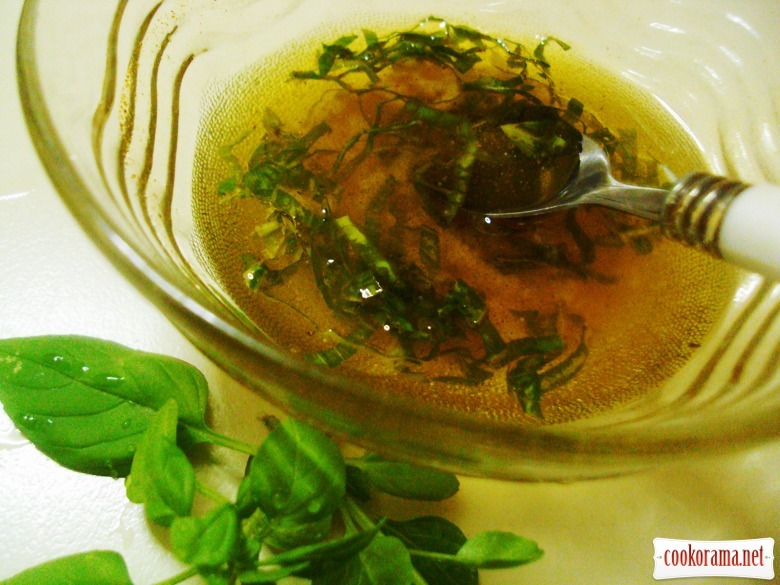 While preparing salad vinaigrette becomes better. Boil the green beans on intensive fire for 5 min. Pour water out and put in icy water (to maintain a saturated color and elasticity of pods). 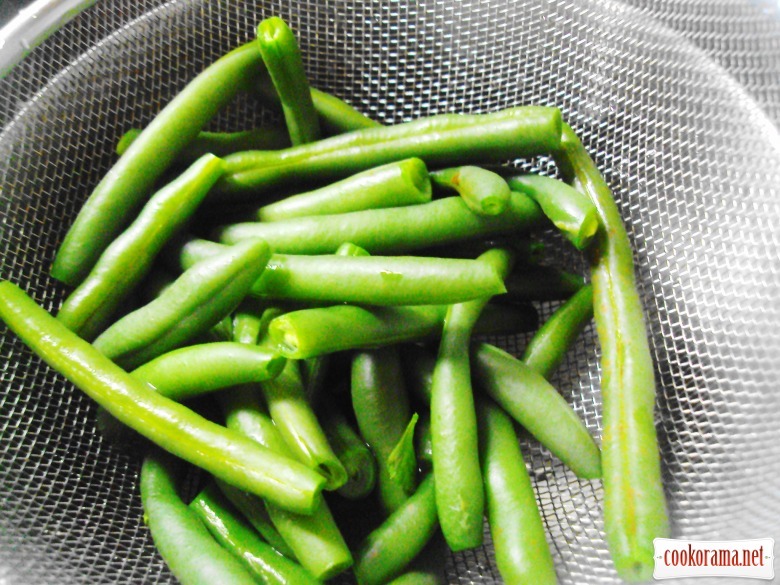 Fold the beans in a colander. Heat 2 tbsp of olive oil and fry in it bean swith crushed clove of garlic for about 2 min. 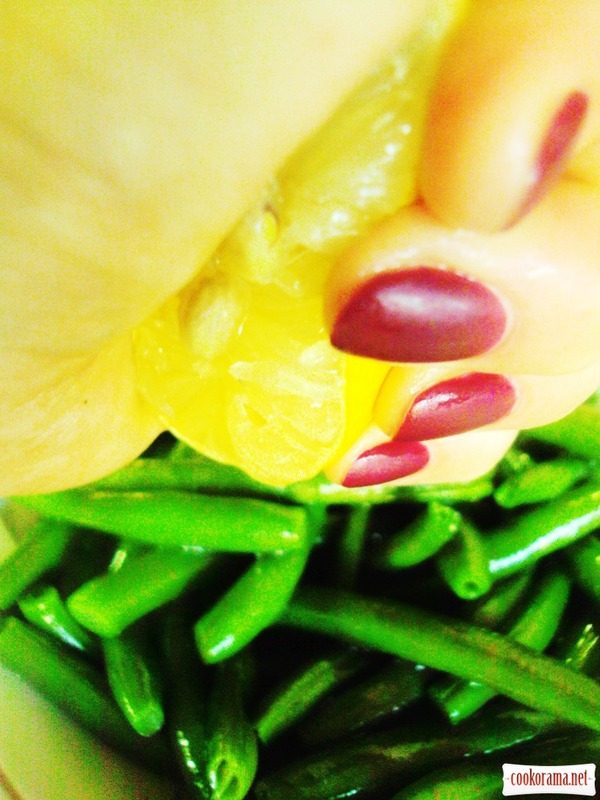 Pour beans with lemon juice. Cut eggs and tomatoes (in 4-6 parts), slice pepper and chop the onion. 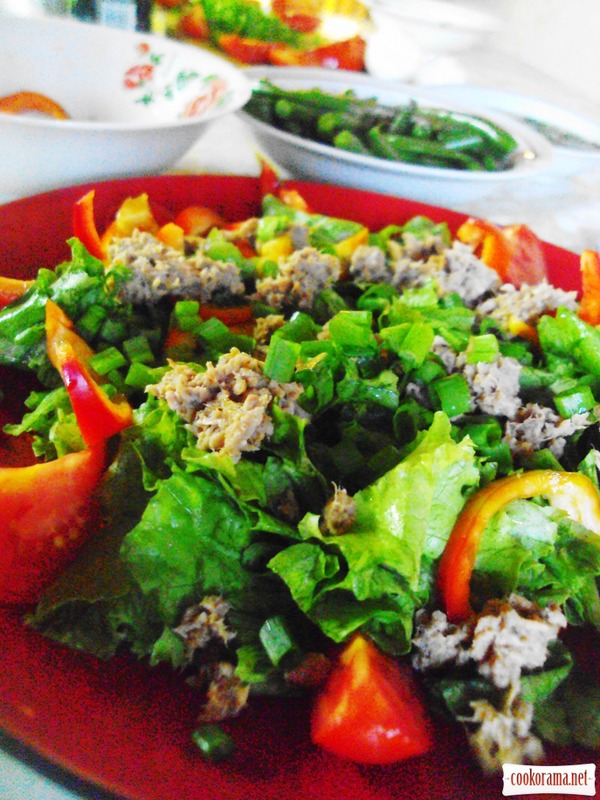 Spread a layer of lettuce on the dish (tear the leaves), layer of pepper, layer of tomatoes, layer of onion and beans. Put oieces of tuna on the top (mine had not a presentable look. I «hid» it among layers of vegetables), anchovy fillet, olives (capers) and eggs. Top of recipe "Salad "Nioise""
Recipes, Vegetable salads, Salad "Nioise"